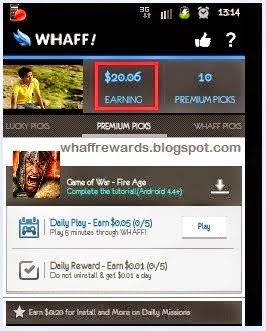 HOW TO TAKE MONEY FROM WHAFF Rewards Go To PAYPALL..?? 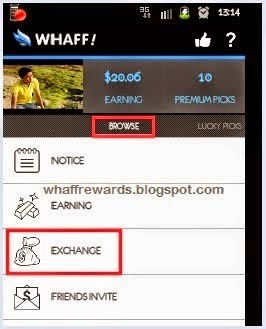 Guide how to attract money from WHAFF into your paypal account is intended for you who want to withdraw income Whaff of it. Cash payment of the Reward Whaff (earning) can be disbursed after the balance in the account reaches the minimum payment point Whaff. In this case the Whaff has set a minimum payment that can be taken is $ 10. 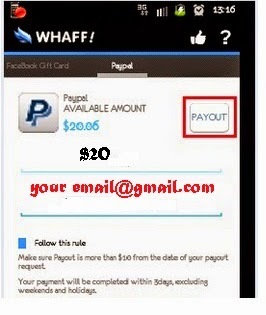 In addition to the minimum payment of $ 10, users can withdraw the money to Whaff Paypal account with a nominal $ 20, $ 30, $ 40, $ 50 to $ 80. The following is an example of how to attract money into your Paypal account whaff. 4. write the amount of money that you will pull your account Whaff. Enter your Paypal email to also be used as a reservoir of Whaff dollars. 5. once the content correctly, next select the PAYOUT. Now take a look at the menu "Payment History" then there you will tell "Payment Request", it means that the payment is being requested and soon to be processed. Will usually require a maximum of 3 working days for money to land smoothly into your Paypal account. 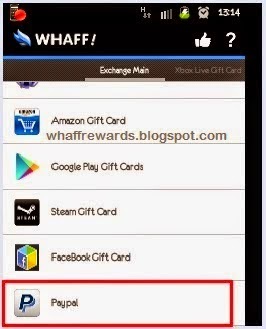 That's tips on how to attract money from WHAFF Rewadrs to your paypal account..
Later if there's a chance I'll give you a way how to Exchange "Earning Whaff" into Google Play gift card.This is useful to buy paid apps in Google play store. 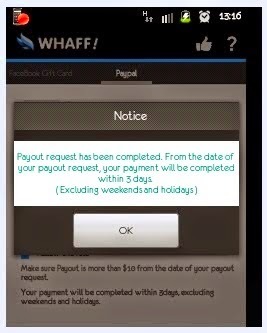 0 Response to "HOW To TAKE MONEY FROM WHAFF Rewards Go To PAYPALL"